Football is one of the most popular sports. Overall, it is associated with a high incidence of injuries. Most injuries affect the lower limbs, and thereby particularly the knee joint is in focus. Direct cartilage trauma and destabilizing soft tissue injuries associated with recurrent microtrauma lead to feasible osteoarthritis in long term. Concerning the treatment and return to play, focal early osteoarthritis has to be differentiated from diffuse early osteoarthritis and advanced osteoarthritis due to its different treatment protocols. For an appropriate treatment, knowledge of the criteria of the focal early osteoarthritis and its treatment possibilities are essential to reach a therapeutic decision. Beside non-operative treatment strategies, regenerative cartilage therapy as well as stabilizing soft tissue and unloading bony treatment approaches have to be considered. 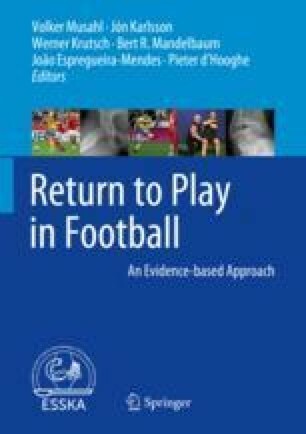 Due to the regenerative properties, a return to play after full consolidation and absolving an extended rehabilitation programme is possible. If instability persists or regeneration cannot be obtained, an individualized downgrading of sport intensity and impact according to the extent of the remaining injury has to be recommended. In diffuse early osteoarthritis as well as advanced osteoarthritis, regenerative potential is lost. So, non-operative treatment strategies are symptom based. As long as they present with minor symptoms, continuation of high-impact sport can remain possible to a limited extent. However, to decelerate the progress of degeneration, a downgrading to low-impact sports should be discussed in accordance to the athletes’ career and expectations. Similar to the non-operative treatment, unloading osteotomy is a symptom-related approach for mal-aligned limbs. After bony consolidation, return to play recommendation is consistent with the non-operative advice. In contrast, replacement strategies reconstruct the degenerated joint. Evidence-based guidelines concerning return to play do not exist up to now. However, there is an expert consensus to reduce the load of sports to a low-impact level. In summary, continuing playing football is possible at all stages of osteoarthritis. However, the particular affected athlete needs to be informed on the consequences of the joint degeneration and the concomitant symptoms of its progression.